Two years have done little to ease veterinarian Audra Hughes’s grief over her husband’s untimely death. Eager for a fresh start, Audra plans to leave Portland for a new job in Philadelphia. Her seven-year-old son, Jack, seems apprehensive about flying—but it’s just the beginning of an anxiety that grows to consume him. As Jack’s fears continue to surface in recurring and violent nightmares, Audra hardly recognizes the introverted boy he has become. Desperate, she traces snippets of information unearthed in Jack’s dreams, leading her to Sean Malloy, a struggling US Army veteran wounded in Afghanistan. Together they unravel a mystery dating back to World War II, and uncover old family secrets that still have the strength to wound—and perhaps, at last, to heal. 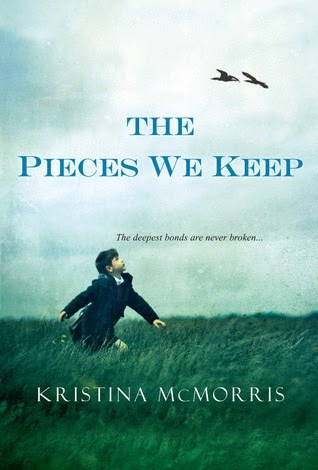 Kristina McMorris has worked the novel’s title into every aspect of this story- it’s a tiny thought that is a representation of all the memories, mementos and family history that travels with us throughout our lives. As I was reading the title kept coming back to me and brought up my own family history in little ways. I often find that a title works for the story but is not as evocative as this. The premise of The Pieces We Keep grabbed me immediately - I loved the nuggets of historical fact that were weaved into the fictional story line and I appreciated the modern side of a mother trying to cope with her husband’s passing and a child who struggles with night terrors. Audra tugged at my heart on every page, her love for her son, her own grief and her desperation in trying to find peace for them both just broke my heart. Although easy to read this is not a light-hearted work - there are some real and troublesome parts that affected me greatly, particularly Jack’s night terrors. I can’t imagine how hard it would be to not be able to get through to my children, and I know there are many families who face these and other more grave situations every day. It made me count my blessings again and again. The historical aspect of Vivian’s story was less emotional for me but contained all the history I’ve come to expect from this author’s writing and I think McMorris weaved the two stories together perfectly. I simply couldn’t read The Pieces We Keep fast enough. Every page turn held something new and every new tidbit of information pushed me to keep reading and find out the truths. I read McMorris’ Bridge of Scarlet Leaves last year and it was a surprise for me to realise how much it stuck with me long after I’d finished reading it - as I’m sure this one will too. I will eagerly be awaiting anything else Kristina McMorris puts to paper. Thank you to Kensington Books for our review copy. All opinions are our own.